I was in toilet when sister texted me, they (nining, sunu and her) already waiting for me at pos satpam 4.30 am! shoot, I was in rush, and forgot to bring my tumbler ! Picked up Nyoman and arrive and Green Office less than 40 mins later. And yes! Unlike last year, 5.30 am sharp, flag off for half marathon category! 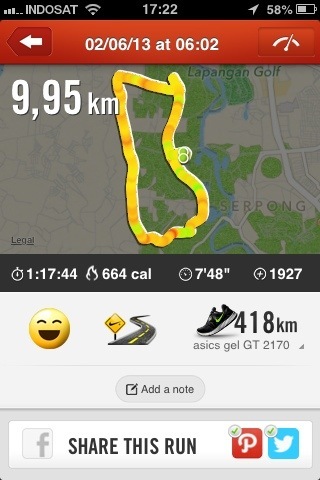 there I go running with Paipo (BTR friends) and Mamat (colleague who currently reside in S’pore). Paipo only run with me for 300 m or so, while Mamat at about the first 2km. 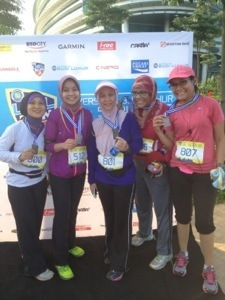 Owh, this year they also had 5km and 2.5km categories which – no wonder – ramai! 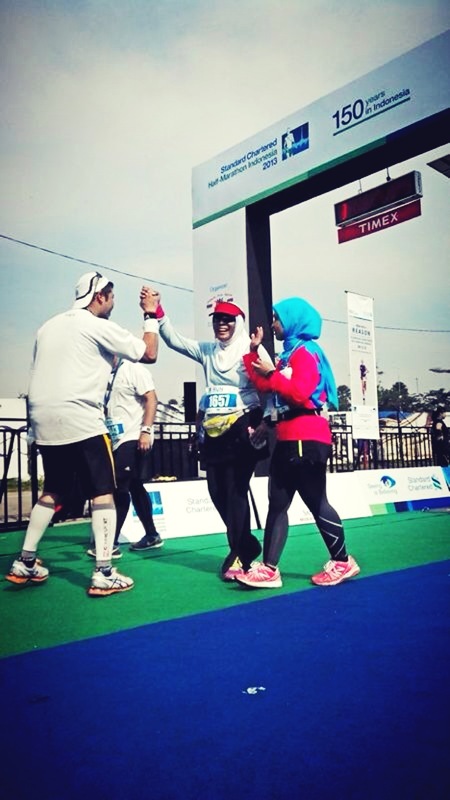 Later I saw Pak Adi, a BII runner I met on my first HM in UI, then in Jak Mar and last one at Samsung 3rd series. Then I come with so called strategy, to keep as comfortable as possible, I stop for every water station just to have a walking break. I thought I’m cool with that. 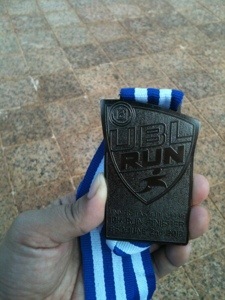 Less than 45 mins later, Luthfi passed me! he took 10K, ish keterlaluan kaw luthfi, 10k?? another 15 mins, Uchie passed me and offered me her drink (from her tumbler) *sweet* :-* . I said I’m ok since I borrowed my sister’s before the race. Uchie, only took 10K because she’d had her second HM the following weekend (which is last Sunday) at Standard Chattered Marathon Singapore. At km 11 something I took a gulp of electrolyte drink, leave the bottle at the middle of the road. There was a-U turn – ahead, so planning to get it back after I make a turn. Oh btw, It is a common thing, may be an “unwritten etiquette” when you run in a race and couldn’t finished the bottled water, Just leave it at the side of the road so other people can use it. errr, it’s unwritten when talking about etiquette, is it. There were many U turns in this route, which for some could be…. intimidating. I saw Roy, Thya (geee, she’s so fast) and other trojans. I get used to the last person in line :D. ? And…similar with last year, there’s no check point, but they gave hair band as a marker. –” As I made u turn, I saw Indra. wondering what was happen to him, he seems tired. Didn’t meet him after the race. I got my calf sprayed later on from a therapy later clinic who opens the booth. I had a sport massage two days earlier. And I think that was in Km 13 or so. 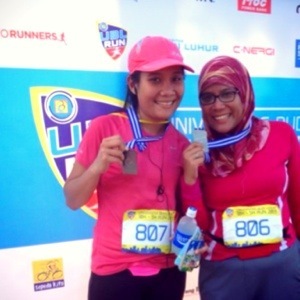 The officer said “ibu ambil 21k?” seems…surprise? I took another gu Gel and salt stick later on. 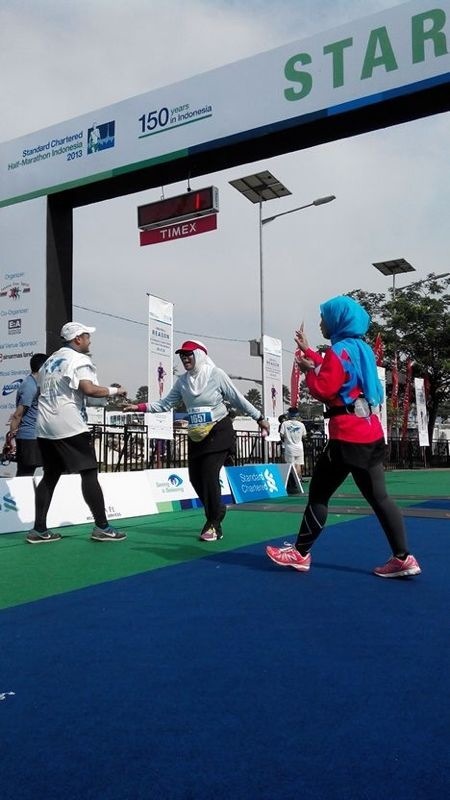 When I saw the “white castle” — you who often run in BSD know what I mean — penampakannya di foto ini — was really really the hardest km for me. 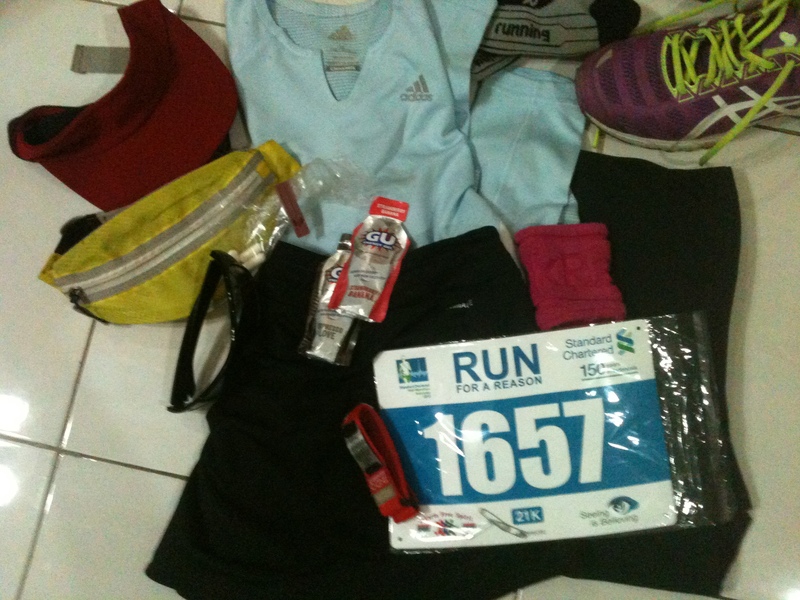 I had my right calf cramped, heat stroke and…I’m all alone –“. 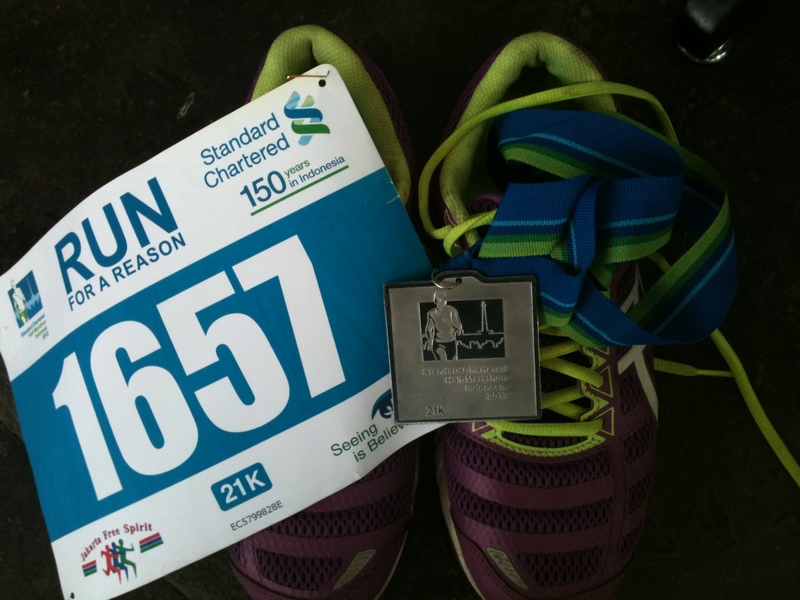 well, as I told you, there was no Km markers, but since there was my 6th time running in BSD (yes 6th timeeeee!!!) I know I had to undergo another 6 km. I had a very brisk walk after 18km, couldn’t move my leg any faster. And, that’s the story of my 3rd HM race. Last year, it took 1:28: 28 for me to finish a 10K now It’s 3 :01: 13 to complete twice its far. and it is my PB for a Half Marathon. kemaren baca postingan bunda 3f, tentang kegemaran keluarga mereka bermain di taman kota BSD. Dulu Taman Kota ini masih boleh bawa sepeda..sekarang sudah gak boleh..